The Cathedral of Saint Paul is a center of life for the Diocese of Worcester. Events such as regional confirmations, ordinations, graduation Masses, as well as other as other community and parish events are hosted at our Cathedral. Last year alone nearly 100,000 people received the Eucharist at the various reginal and pontifical liturgies held in our Cathedral.Indeed, it is the Mother Church of our Diocese and a place where all are welcome and all Catholics, in particular, should feel a sense of ownership and pride. However, today this beautiful symbol of our faith needs our attention.Over the past decades there have been and continue to be efforts both from the local parishioners of the Cathedral and from our diocesan family to address the building, especially its beautiful interior. A study conducted this past year brought a sense of urgency to the fact that the bell tower needs to be structurally reinforced and repointed.Additionally, the tower’s electrical and mechanical systems will need repairing and updating. 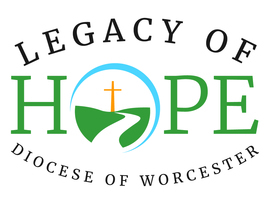 The Legacy of Hope campaign will allocate $500,000 to help reinforce the outer structure of our Cathedral with specific attention to the tower as well as complete interior renovations so that those attending the Cathedral may participate without distraction in the sacramental and other celebrations.